North East Grinding | Starrett – Wood, Metal & multi purpose Jigsaw blades. 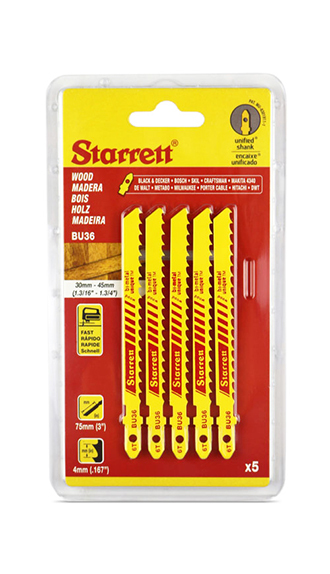 Starrett – Wood, Metal & multi purpose Jigsaw blades. Starrett Bi Metal Unique™ Saw Technology, with Unified Shank™ Jig Saw Blades will fit in virtually all jig saw machines. Starrett Jig Saw Blades typically last 25% longer than directly competing products. Starrett Bi Metal Unique™ Saw Technology, with Unified Shank™ Jig Saw Blades will fit in virtually all jig saw machines. Our Unique™ Blades feature 170% more weld contact area than standard bi metal blades through the Unique™ solid state diffusion bonding process. This ensures exceptionally strong teeth, combined with the Multiple Cutting Edges and Split Chip Advantage, ensure that Starrett Jig Saw Blades typically last 25% longer than directly competing products. For the ultimate in surface finish on the top and the bottom of the material being cut, Starrett Dual Cut blades are the ideal solution. The revolutionary patented tooth design means that Dual Cut blades cut on the upstroke and the downstroke of the machine, ensuring that there is no break out on either side of the material and absolutely minimal chipping of any surface coating. Dual Cut blades are ideal for any application where quality of surface finish is important, but they are particularly suited to cutting soft & hard wood, MDF, acrylic, Formica, melamine and other coated materials. The blades are available in two packs in a standard or a scroll cut format.